When the group of York University social work students planning to take supplies to the refugee ‘jungle’ in Calais came to a York People’s Assembly meeting, as we’d offered our support, we asked them to report back on their experience following the visit at the end of September. 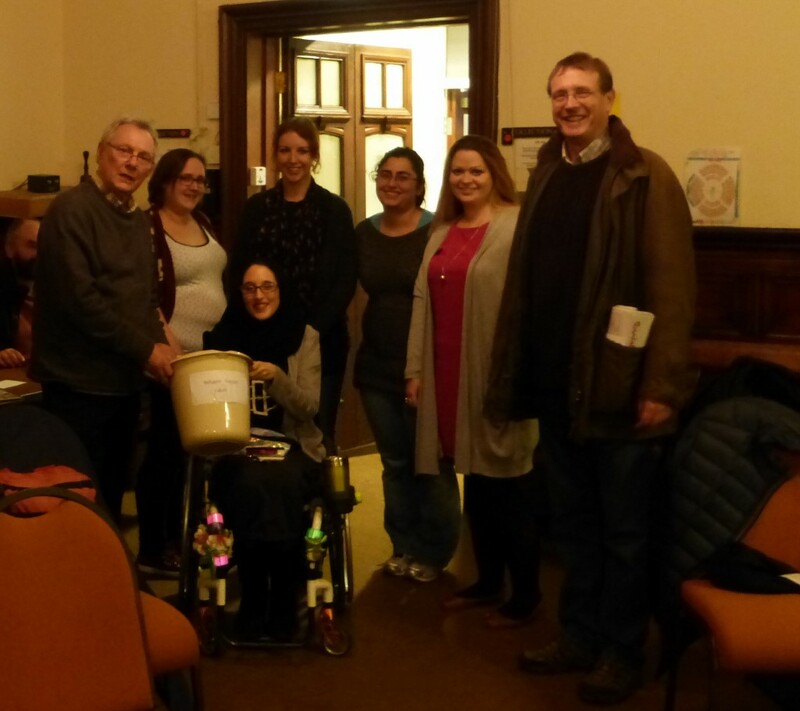 On the 4th November 2015 we held a public meeting at the Friends Meeting House in York with around 60 attendees to hear three of the six students (Miki, Gizem and Emma) along with Helen, who’d taken a week off work to act as a French interpreter for them, and Jo (from Yorkshire Aid, the Agape project and United Rescues) describe their visit, discuss the refugee crisis and consider what could be done next. The students are all soon returning to volunteer in Calais, Helen is going to Serbia to help with the migration and Jo continues to volunteer monitoring SOS messages from those travelling in small boats from the war zones. This was their first public talk about what they’d seen, experienced, and learned. Originally the students had planned a couple of car-boot loads of materials and to raise £500 by crowdfunding, but with the aid of publicity they took a lorry, a van and two cars and raised over £3500 to buy materials needed in the camps. The support by the people of York for the refugees was obvious. On first reaching Calais the group first went to the warehouse where volunteers i help organize deliveries into the camp, they then visited the camp themselves but it was difficult to describe a “town made out of bin bags”, but hoped the £1200 the team had spent on tents might bring some comfort to those trapped there. The people they met on this occasion were a mix of Syrian, Sudanese and Eritrean but above all refugees from war zones. Helen had taken a 35 litre rucksack packed with medical supplies and spent the week delivering first aid. Her and a colleague used 200 pairs of gloves in a single afternoon of assisting. There were old unattended wounds not just recent injuries to deal with. She was dealing with scared little boys not the fit young men with smartphones the media portray. Calais Council does not collect the waste, the toilets are woefully inadequate and it is estimated the population is currently 6000 men,women and children. The major need is for people to go and do things – assist with constructing the temporary shelters and provide help with cleaning and clearing the ‘jungle’, along with delivering medical assistance from minor to major health care. If people are donating food they need to consider there is no clean water and that baked beans are only liked in the UK! It iwa also felt necessary for people to campaign to raise awareness with their MP’s of the need for funding and action. Jo spoke of the need to get medical assistance there for although there is a medical van and medecins sans frontiers are there, this is limited. Yorkshire Aid need funding to take a van with medical support across to Calais. She also volunteers on the 24 hour SOS line taking message from boats crossing the Mediterranean Sea and alerting the authorities to rescue them – this has so far been 100% successful. More volunteers are also wanted to work shifts doing this. Everything isn’t rosy but by the refugees are working in small groups to find and cook food and look after themselves. Unfortunately, even when refugees make it into the UK things are still far from perfect with language communities being separated and there is also a need for assistance with English speaking conversation groups. It doesn’t all stop at Calais – people are needed on Lesbos to rescue children from the sea, along with more basis support like cooking warehouse work and just listening and being supportive. Facebook has been a major means of working with refugee supporters and that was a key way of finding out what was happening and needed – just search on ‘refugee’.Some links below. At the end of the meeting those present gave the women a standing ovation and a bucket collection raised £436.60 for Jo’s SOS project. 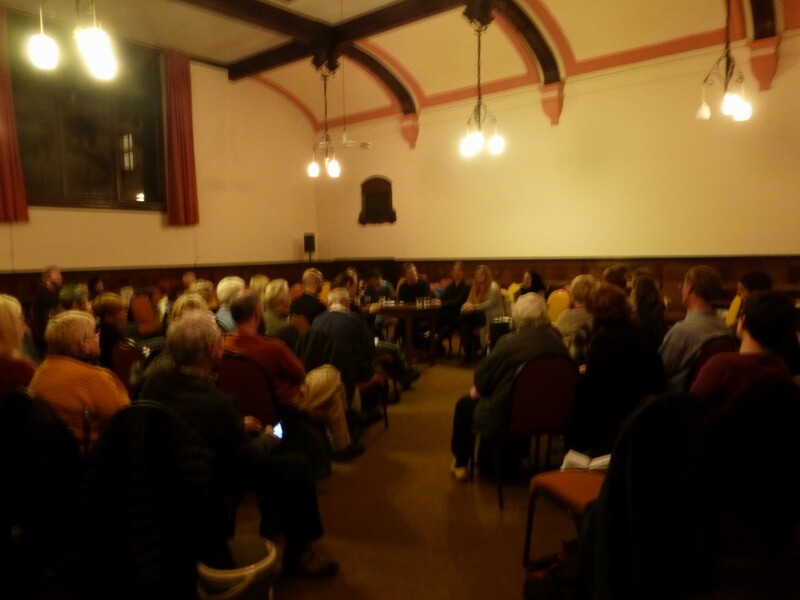 Those attending also confirmed an earlier York People’s Assembly motion that the City of York Council’s proposed quota for refugees was woefully inadequate, and that all possible should be done. The meeting also agreed to support Rob Lawrie who had been arrested in France for trying to smuggle a child refugee away from the camp to her relatives in Yorkshire, with the support of her father. It also wanted to propose and support any further actions in York highlighting the refugee crisis. They are holding an afternoon of Refugee Trauma Support Training for volunteers in York on 28th Nov. They would like to add a ‘top-up’ first aid course in the morning if someone qualified to do it will volunteer. The details of the afternoon will be on Eventbrite. This entry was posted in Fundraising, Global, Human Rights, Other Campaigns, Uncategorized and tagged Calais, refugee crisis by greatemancipator. Bookmark the permalink.